Tronsmart Draco AW80 (click for full specs) is the first octa core Android TV box / mini PC thanks to Allwinner A80 processor. Draco AW80 Meta model comes with 2GB RAM / 16GB eMMC, and the upcoming Draco AW80 Telos will feature 4GB RAM and a 32GB eMMC. Geekbuying sent me the Meta version for review, and since I’ve already posted pictures of the device and board, today I’ll post my findings after testing the unit. I’ve inserted two AAA batteries in the provided remote control, and it works as expect, but as usual, I’ve used Mele F10 Deluxe air mouse to control the device during my testing, since it’s impossible to use most apps with an IR remote control, XBMC/Kodi being one exception. I’ve connected an HDMI cable, a USB 3.0 hard drive to the USB 3.0 OTG port of the TV box, an Ethernet cable, a USB webcam, inserted an SD card, as well as a USB hub with RF dongles for my air mouse and Mars G01 gamepad, and USB flash drive. There’s no power button, and the board boots immediately as you connect the power. It takes about 44 seconds to complete, which is quite slower than the 20 seconds with Rockchip RK3288 TV boxes coming with a fast eMMC such as HPH NT-V6 or Kingnovel R6. We’ve got a clean Android home screen without any icon. The output resolution was 720p by default, but I switched to 1080p60. Let’s go to the Android Settings. The Wireless and Networks menu features the usual Wi-Fi, Bluetooth, Ethernet, and Data Usage sections, as well as a “More” section with VPN, and Tethering & portable hotspot.… You can enable pass-through in the Sound Settings, and select three audio output modes: “AUDIO_CODEC”, “AUDIO_HDMI” and “AUDIO_SPDIF”. The dpi settings are set so that he box is better used as a mini PC (1 meter from screen) rather than a TV (e.g.3 to 4 meters) and the font size is quite small, so you may want to change the font to “Huge” if you are using the device as a TV box. The Display menu also let should select several output modes: 720p 50/60, 1080p 24/50/60 or 4K 30 for HDMI ,and PAL or NTSC for composite output. I’ve only used HDMI, not composite output. The 16 eMMC flash in Tronsmart Draco AW80 Meta is partition in a single 12.04 GB “internal storage” partition for apps and data, with over 11.2GB available space. There are also some options to “enable media scanning” on SD card and USB, and enable “Blu Ray directory play mode”, but I’m not sure what’s the exact use of these functions. 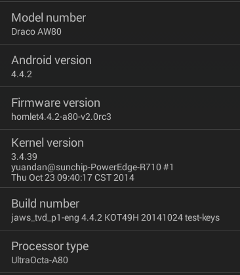 The “About Box” section lists the model number as Draco AW80, and Android 4.4.2 running on top of Linux kernel 3.4.39. The build number is jaws_tvd_p1-eng 4.4.2 KOT49H 20141024 test-keys, which jaws_tvd_p1 being the board/platform name. The firmware is rooted, and the “System Update” (no s) menu can perform OTA updates. I haven’t been able to test this feature, as there’s no new firmware, but the server check seemed to work. In the video below, I boot the device, and go though the system settings, and play a video in Kodi. I could install all apps required for the review from Google Play Store, except Vidonn activity tracker app again reported as “incompatible with your device”. This happens with many devices, so it could be any issues wit hthe app, rather than the firmware. I’ve also downloaded and installed Amazon AppStore in order to load Riptide GP2 game, which I got as a “free app of the day”. Power handling may look like a detail, but the lack of power off function may lead to flash corruption because you need to cut the power from the mains, so I first was disappointed when I discovered Draco AW80 did not have power button in the unit itself. But luckily, they’ve done things right after all. The first time you connect the power supply, the box will start automatially, but you can use the remote control (Mele F10 Deluxe also work) to put the box in to standby (short press), or power the device off (long press). You can also turn it back on with the remote control power key, so you don’t need to get up from the sofa…. Thanks to the large heatsink and metallic enclosire, the box stays pretty cool, and after Antutu benchmark, the maximum temperatures measured with an infrared thermometer on the top and bottom of the box were respectively 39°C and 41°C. Draco AW80 firmware is very stable, and the box feels fast and snappy, with a performance “feeling” pretty similar to Amlogic S802 and Rockchip RK3288 based devices. I did not have any problems of the box hanging, except with Riptide GP2 as we’ll see below. This media player comes pre-loaded with Kodi 14-alpha 3. Normally, I would use a SAMBA share to play video over Ethernet, but at first XBMC/Kodi failed to find any network shares, so instead I played most videos from a USB hard drive, and only switched to SAMBA + Gigabit Ethernet later for the remaining videos, once I manage to connect. If Kodi had problem to play a particular video, I switched to MX Player for further testing. Kodi – It can play smoothly at first, but after several seconds, many frames are dropped, leading to a slow motion effect. Real Media (RMVB) – RV8, RV9, and RV10 – OK. Smoother than other ARM platforms. 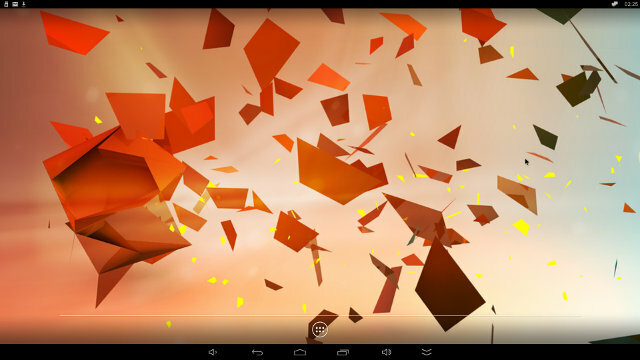 MX Player – Black screen with H/W decode. The videos can only be played by selecting S/W decode, which looks OK for 480p/720p, but can be choppy in some scenes @ 1080p. Most videos can play, even though I had to switch to MX Player for smooth MPEG2, but H.265 / HEVC video completely failed to play with both players. h264_1080p_hp_4.1_40mbps_birds.mkv (40 Mbps) – OK at first, for some frames are skipped and dropped near the end. hddvd_demo_17.5Mbps_1080p_VC1.mkv (17.5Mbps) – OK, but many frames are dropped, so the video does not feel that smooth. Jellyfish-120-Mbps.mkv (120 Mbps video without audio) – OK both from USB and SAMBA (Ethernet). AC3 – OK, but aspect ratio strangely set to 1:1. Sintel-Bluray.iso could play well in XBMC/Kodi, so Blu-Ray ISO are also supported. Yet again 4K videos are a disappointment, especially with the latest HEVC/VP9 codec, but none of the recent devices can handle all of these properly. Beauty_3840x2160_120fps_420_8bit_HEVC_MP4.mp4 – Slow motion (S/W decode) in Kodi, and even in MX Player where the app (incorrectly) mentions H/W decode. Bosphorus_3840x2160_120fps_420_8bit_HEVC_MP4.mp4 – Slow motion (S/W decode) in Kodi, and even in MX Player where the app (incorrectly) mentions H/W decode. Jockey_3840x2160_120fps_420_8bit_HEVC_TS.ts – Slow motion (S/W decode) in Kodi, and even in MX Player where the app (incorrectly) mentions H/W decode. Finally, I played some several AVI, MKV, FLV, VOB and MP4 videos all from the SAMBA share, and they could all play. However, I could notice some serious dropped / skipped frame issues in a t least two videos, sometimes it plays smooth for a while, and suddenly frames start to be dropped. I could not find a sure way to reproduce the issues. In order to test stability, I also played a 1080p H.264 MKV video (1h50), and I had no problem. I did not notice frames dropped during my periodic checks, but Kodi did report 522 dropped frames, and 1021 skipped for the whole movie. As a side note, Kodi/XBMC normally makes use of all cores available on a platform, but with Allwinner A80 only two cores are used. Links to various video samples used in this review and be found in “Where to get video, audio and images samples” post, and especially in the comments section. In order to evaluate network performance, I transfer a 278 MB file between a SAMBA share and the internal flash, and vice versa, using ES File Explorer, and repeat the test three times. Since Draco AW200 support both 802.11 b/g/n (2.4/5.0Hhz) and 802.11ac (5.0GHz), I use both my default router TP-Link TL-WR940N router for 802.11n, and TP-Link TL-WDR7500 (Archer C7) for 802.11ac testing. Wi-Fi performance of this mini PC is quite good reaching 2.89 MB/s (23.12 Mbps) for 802.11n, and 4.010 MB/s (32.08 Mbps) for 802.11ac with a reported link at 390 Mbps. This mini PC is one of the few devices I’ve tested with a properly working Gigabit Ethernet connection, the only other being Orion R28 Meta, also from Tronsmart. I’ll also tested it by copying a file between SAMBA and the internal flash for reference only, since the transfer is limited by the flash writing speed, but this still gives an idea of time it would take to copy a file. As we’ll see below, the fastest storage option in this box is a USB hardware drive formatted with FAT32, where I can transfer a 928MB file between SAMBA and USB FAT32 in 44 seconds (21.09 MB/s), and from USB FAT32 to SAMBA (SSD) in just 35 seconds or about 26.50 MB/s. For a raw network performance number, I also used iPerf app and iperf in my Ubuntu PC, using “iperf -t 60 -c 192.168.0.104 -d” command line in Android. I’ve only tested Gigabit Ethernet, and skipped Fast Ethernet. I’ve got about the same numbers with A80 OptimusBoard, a development board powered by Allwinner A80, so the asymmetric performance may be due to limitations of the Allwinner octa core processor (TBC). I could transfer a few pictures by pairing “Draco AW80” to my ThL W200 Android smartphone. I managed to connect my PS3 wireless controller clone to the device with Sixaxis Compatibility Checker app, and get the device recognized by following those instructions. I installed vidonn.apk manually, since It’s reported as not compatible in Google Play, and my Vidonn X5 activity tracker could connected to the device with Bluetooth 4.0 LE, and data was synchronized properly. So full mark for Bluetooth! NTFS and FAT32 partitions on my USB 3.0 hard drive could be mounted, and read/written to, but as usual EXT-4 and BTRFS are not working. A1 SD Bench was used to benchmark performance of the internal flash and USB 3.0 partitions. I also planned to test the SATA connector, but taking out the hard drive from the USB enclosure prove a bit more challenging than expected, so I skipped that part. I set the custom location to /mnt/usbhost0/8_17 in the benchmark app to test the NTFS partition. Since my external drive is a USB 3.0, and it can deliver 100+ MB/s read speed, and 46 MB/s write speed (NTFS partition) in my PC, I was expecting some very good results. But I quickly got disillusioned, as it’s even slower than some other devices with a USB 2.0 connection. The read speed was 25.29MB/s, and the write speed of 12.57MB/s. The Samsung eMMC found on the board has pretty decent performance, but quite far from the theoretical values (160/50 MB/s) with 32.41 MB/s read speed,, and a 11.06 MB/s write speed. It’s not quite as fast as some RK3288 devices, which partially explains the relatively slow boot time. Nevertheless that’s fast enough, and I only experienced a severe slowdown once (mouse pointer stuck for 2 or 3 seconds) while I installed multiple apps. Skype works OK, both with Echo service in Skype, and making a call. However, once I tried to record a video message, and it looked OK during recording, but the video was corrupted when I played it. Google Hangouts is basically unusable, as it quits whenever I start a chat session. The three usual games where used to test gaming: Candy Crush Saga, Beach Buggy Blitz, and Riptide GP2. I played Candy Crush Saga with Mele F10 Deluxe, and it was nice and smooth as expected, and the two racing games with Tronsmart Mars G01 wireless gamepad. Beach Buggy Blitz is ultra smooth even with graphics settings set to the maximum. However, I had great problems while playing Riptide GP2. The first time, the image simply froze after 6 seconds in my first race, but I had used to box a few hours before. So I waited for a little while bit, and restarted the box. I could play one full race relatively smoothly, but in the second race the image froze again. Sometimes, the races won’t even load, so it was quite a disaster with that. So I also had to skipped the temperature measurement after the game, so I would not play it for more than 3 to 4 minutes if I was very lucky. Before benchmark the device, I ran CPU-Z app toget some more information. 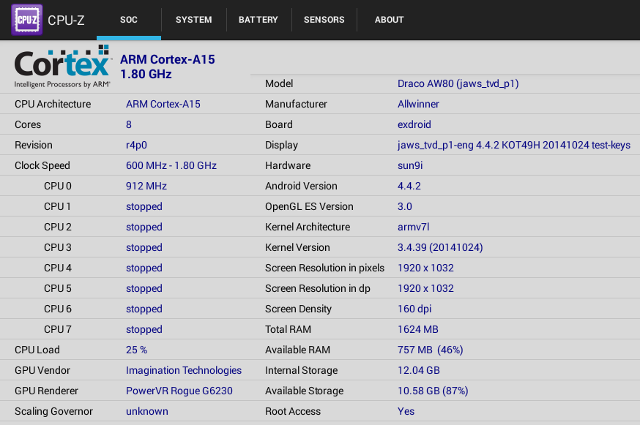 An octa core processor is detected with ARM Cortex A15 cores, so it seems CPU-Z does not handle heterogeneous CPU architectures for now. The GPU is correctly detected as an Imagination Technologies PowerVR Rogue G6230. The model is called Draco AW80 (jaws_tvd_p1), with 1624 MB RAM (the rest being used by the GPU. VPU, and other hardware blocks), and the storage partition is 12.04 GB just like in the Android settings. The screen resolution in pixel and dp are the same at 1920×1032, which explains why the font looks small. Other systems often have a lower dp resolution, but if you plan to use the system as a computer a higher resolution in dp is better. With 49,657 points (unverified), Draco AW80 is by far the fastest Android mini PC on the market, at least according to Antutu. Having said that, silicon vendors and manufacturers tend to try to cheat with Antutu, so the score should not be blindly relied upon. 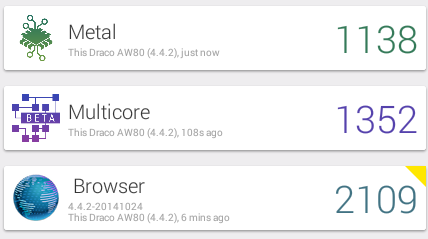 That’s why i could be useful to run other benchmark, such as Vellamo 3.x. 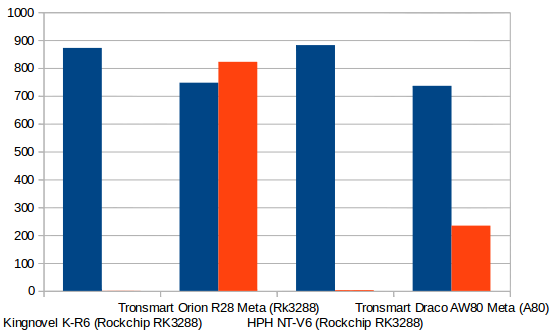 For some reasons the scores are significantly lower than on Rockchip RK3288 (Nagrace HPH NT-V6) for all three benchmarks: 2,109 points for the Browser test (vs 2,549), 1,138 points for the Metal test (vs 1,457), and 1,352 points for the multicore test (vs 2,003). The latter is all the more surprising because Cortex A15 cores are supposed to be faster than Cortex A12/A17 cores, and Allwinner A80 has 8 cores to play with (4x A7, 4x A15) instead of the four Cortex A12/A17 on RK3288. Maybe the scheduler reduces the frequencies of the cores if they all run simultaneously. 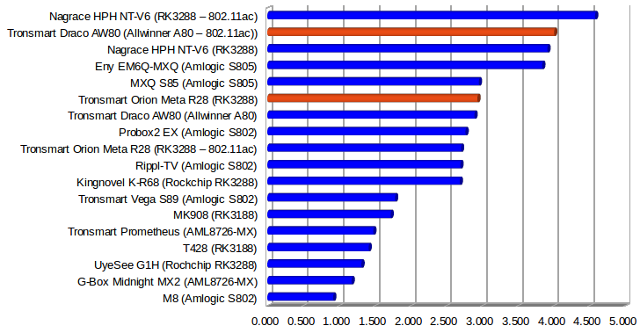 I’ll write a separate post to compare all these results side-by-side between A80 and RK3288. Ice Storm Extreme benchmark score (6,461) in 3DMark is also lower compared to Rockchip RK3288 based media players which score between 7,000 and 7,500 at 1080p resolution. Tronsmart Draco AW80 has some exciting specifications with a fast octa-core processor, high speed interfaces like USB 3.0, SATA, and Gigabit Ethernet, and the potential to support Linux. The device feels fast indeed, and stable, with very good Wi-Fi and working Gigabit Ethernet (a rare thing!). Video playback is OK most of the time, but VP9 and H.265 are simply not properly supported in either Kodi and MX Player, and I’ve noticed some apparently random issues with skipped frames while playing some videos. USB 3.0 performance is disappointing, and if you thought SATA would bring a boost in storage performance, I would not hold my breath (not now tested) as it’s implemented via a USB 2.0 to SATA bridge. So all in all it’s a pretty good device, but maybe not just as good as could have been expected from the specs. Video Output – 1080p support 24, 50 and 60 Hz output. 4K @ 30Hz should be supported (not tested). Aluminum casing and heatsink keep the device cool (40 C). Some 3D games may have problems to run, at least, Riptide GP2 is basically unplayable for me due to the game freezing. Skipped frame issues in some videos (appears to start randomly). Google Hangouts can be used with webcam (can’t start chat). Slow write speed on NTFS/USB partition, USB 3.0 performance slower than most TV boxes with USB 2.0 port. SATA should be the same (USB 2.0 to SATA bridge) performance is equivalent to, or even lower than, USB 2.0 drives performance. Gigabit has an asymmetric performance (720Mbps / 220 Mbps) according to iperf, but still good enough for most use cases. Tronsmart Draco AW80 Meta reviewed in this post sells for $149 on GeekBuying, and the upcoming Draco AW80 Telos with 4GB RAM and 32GB eMMC flash is available for pre-order for $199, and is expected to ship by the end of the month. You can also purchase either model on Aliexpress or DH Gate. All devices are different, and RK3288 still has problems too, but at least H.265 is working smoothly in some players. So many folks have videos that are in Xvid and DivX. Has a good test been done to see if these work? Can a 3tb external hdd run smoothly? Does the A/V port work? So many are focused on the big things. I just want to confirm these small things that should work fine, but you never know. HW decoding of xvid and divx tends to vary but all have the muscle for software decoding at least until 720p (I have never used a 1080p xvid/divx file so I can’t be sure). Antutu X and No-frills CPU Control (Performance + noop)? Xvid/divx and analog video?!? Where “so many folks” still use such ancient/obsolete equipment? Are those things still made? I just want to make sure that Xvid and DivX will work with no skips. if I choose to use the box in a room with a tube TV, I would like it to work. A 3TB HDD is large, and I hope it would work fine. Everything I listed should work. I’m not asking for much. I just want conformation. This box seems to be shaping up to be the one to buy. At $150 (high price) I just want to make sure. I’ve tested PAL and NTSC output, and I could not make it work. Some of the AVI I test are Xvid and DivX, and they can play, but as I mentioned in my review, I can see some dropped frames in some videos in Kodi. Maybe if you use another player it’s OK. I don’t know about 3TB hard drive. I’m not sure why it would not work. My USB hard drive capacity is 1TB. Well, $150 for a media player is way too steep, especially if not aiming for 2160p/h.265, for 1080p/h.264 pretty much any ARM stick works just fine, pwrsonally using el-cheapo RK3066 stick for most media usages, some high-bitrate ones work better on RK3188, even with the same GPU/VPU combo. 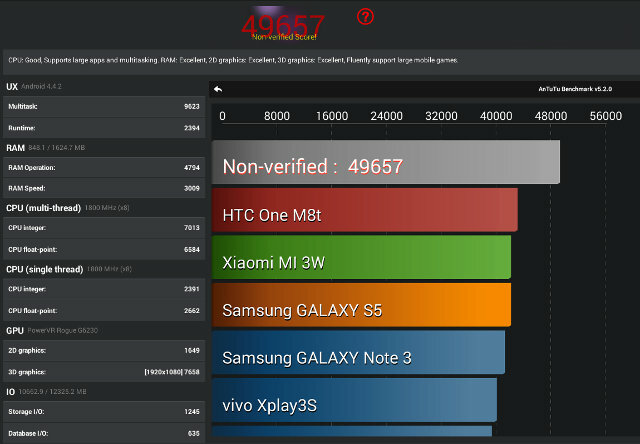 No frills CPU control set to performance + noop, and AnTuTu X Benchmark Sep,2014 https://play.google.com/store/apps/details?id=com.emobile.flashlight&hl=en. 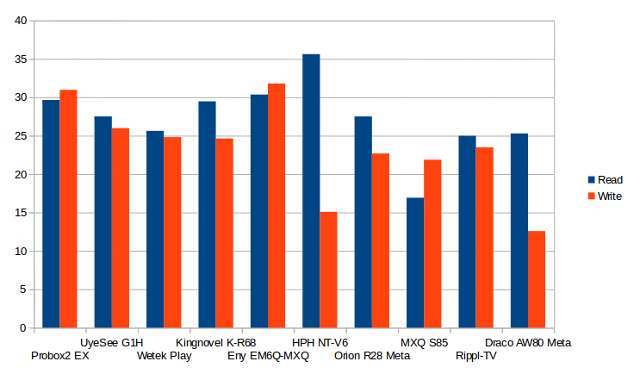 The Performance + hoop should help video play quite a bit, at least on RockChip processors the memory frequency scales with it too, and mem bandwidth is a big thing on video decode, not to mention no more the ms-range delay every time the frequency changes. If it is only GPU compute, that’s quite disingenuous of Allwinner to list H.265 and VP9 as part of Allwinner A80 features. But I’m afraid it might be the case here. I’ve just checked the datasheet. VP9 and H.265 are not mentioned at all. “I’ve test PAL and NTSC output, and I could not make it work.” I’m sorry I don’t follow you. I know what the term PAL and NTSC are. (Europe and North American) I don’t know what is not working? If it really does not have H.265 decode, and possibly not do that at 2160p… I would not touch that with a ten foot pole, better chips are already sold cheaper, like the RK3288, that has H.265 support, or even better the S812 that seems to be the only one capable of native 2160p frame buffer(s). H.265 in itself has nothing to do with resolution, you could even use those ancient MPEG2-based Divx/Xvid encoders at UHD/4k resolution, of course that would be simply stupid, as both H.264 and H.265 beats those on all aspects (except CPU cycles used, without VPU encode). 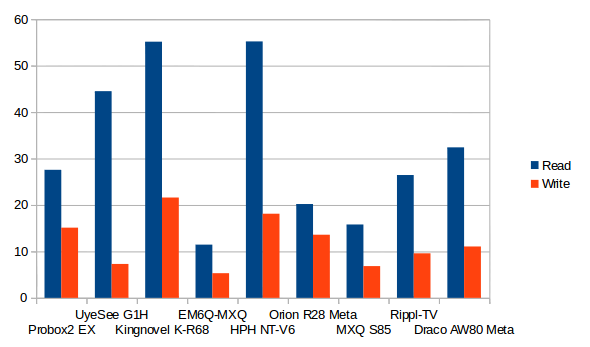 H.265 aka (HEVC) is a new video codec http://en.wikipedia.org/wiki/High_Efficiency_Video_Coding. Basically it allows to cut the size a video by half with the same quality as H.264 video codec. PAL and NTSC output are options in for composite video output (to be used with the cable you linked to on Ebay), and I could not make it work (Black screen only). So unless I did something wrong, only HDMI works with this box (for now). so for a topbox was is better? Ok, so if the A/V port doesn’t work and it doesn’t seems to work with H.265. This wouldn’t be the box for me. Most of my older videos are Xvid / DivX. Why? I converted them to work in DVD players that could play DivX, a while back. Now I don’t care for DivX / DivX. Why? Avi’s are large and I want to have better quality with less space used on the drive. Lately my videos have been .mp4 and .mkv’s. From what I gather in the near future videos will be in H.262 MKV. Any resolution size will benefit. The file size will be smaller, taking up less HDD space. I’m all for that! I need the a/v cable, and I need it to work. I still want a box that I can alter the way the menu looks, and one that have good support. Minix seemed like a good brand, however, it doesn’t have the A/V port for SD TV’s. So, what is the box for me? I think that Allwinner might be using a licensed HEVC/H265 software decoder that supports GPGPU offloading to GPU using GPU compute, and that is why Allwinner do not feel it is a marketing lie to include it in their listings. Regardless I do not think it supports HEVC/H265 hardware decode using its VPU and if it doesn’t then most applications like XBMC/Kodi will probably not be able to take advantage of it under Android, and you can completely forget about Linux support. topbox probably means you mostly want to play videos, so Amlogic S812 should be better, provided it’s as good a Amlogic S802 + H.265 support. Orion R28 Pro or Meta would do the job. H.265 is working with MX Player (most videos), and the A/V port is working. WHen I tried i had an annoying green bar on my TV in NTSC mode, but it was OK with PAL mode. If I can I’m going to hold off from getting a box until I find the perfect one. I’ve looked into the orion recently. What other boxes are coming out soon? Could you test Miracast, DLNA on this device ? How to make it work and how well does it work ? I just received it and so far, i can not make Miracast work with an Asus tablet!!! Are you from Vietnam. Where did you buy it? I’ve just tried Miracast. Both my phone and draco aw80 can see each other, but the connection never completes. So it does not work at all for me. 6) With Chrome web browser, I tried to download a movie from disk.yandex.com, it’s very slow by clicking the download button from the web page. I get a much better speed when downloading the same movie from Windows 7. When I download any video from OPERA browser by clicking the download button from the app, the speed is very fast!!!! Something wrong somewhere ???? I use this device mostly to watch movies from internet. So far, with this OS, I don’t get anything better than UG007B (RK3188). I trusted the hardware spec, and I’m wrong in this case!!!! About Cons 1) Very small font. I think manufacturers should think about having two modes. A PC display mode with high dp resolution (e.g. 1920×1080), and a TV display mode with a lower dp resolution (e.g. 1280×768), but still using a 1080 framebuffer. Most boxes set a lower dp resolution compared to the actual framebuffer resolution, so it looks nice and clear if you sit further from the screen. It’s like you PC is hard to read if you sit three meters from the display. Anyway, I think the dp resolution is something that can be changed in build.prop or some other files, so you can expect better “ROMs” soon. A standard rule is that brand new devices usually have quite a few problems so it pays to wait a few months, if you want to have a better user experience. 1) can be fixed by change the DPI,and i have asked them to change that in next firmware release, don’t worry,it’s not a big problem, change the dpi to 240, your problem gone. 2)google hangout problem, have you tested that on ug007b is that work? i have been told the google hangout use the mobile service which lack in the device, so it crash. 3)Miracast testing here is working, what is your device? it should not work with samsung or sony device which require hdcp, we have written that clearly in the description. 4)google tv remote is confirmed working here, make sure your aw80 and smartphone/tablet in same network. i am sure it can work, because i test by myself. 5) tell me the detail how you test the DLNA and Airply. do you use any apps for testing the DLNA? and which video do you use for testing? 6) tell me which movie you want to download? i will ask factory to test, if opera can download fast, i am sure the problem will also be able to fix. Very happy to have news from you!!! 2) Google hangout NEVER works with UG007B, nor Skype, nor any camera app. So Meta is certainly better with Skype. That works fine with “Camera ICS” too!!! This is a pro. 3) I have Samsung TV, but i that doesn’t count because it’s connected to Meta with HDMI. I have Asus tablet (ME173 model). This tablet works fine with ug007b. On ug007b, i start “Wifi display”, and i start Mirror on Asus tablet, the connection will be done et i see the screen of the tablet on TV. With Meta, i start Miracastreceiver and Mirror from Asus tablet. They are connected, but a black screen on my TV. This is not a big issue because i don’t use it. 4) I just test Google Tv remote on Asus tablet (ME176C), and the app says “no device found” in the network. I will test it again with 3 others tablets (1 ACER, 1 Samsung, 1 other Asus ME173) and i will let you know. 5) I want to rectify: DLNA WORKS WELL with Imediashare, no problem at all. I believe that FLIPPS app has bugs!!! 6) Agree with you, Opera download fast. Youtube works well with HD video. So, internet speed is not the cause. Try to upload and download a video (mp4) from disk.yandex.com and maybe you see how slow it is + it’s impossible to watch that movie from any web browser (sluggish). I can watch the same movie with stock browser on UG007B!!! I use another tablet to monitor traffic on my router. That’s how I discovered the problem. Thanks for your support. Please note that I mentioned only 2 pros, but you should take into account all the pros analysed by cnxsoft. Same thing with cons!!! On Tronsmart Meta, i start no special app. I installed “Androi TV remote” by Google on 4 tablets : Acer A700, Asus ME173, Asus ME176C, Samsung TAB 4, They are on the same network 2.4. I have the same message in 4 tablets when i start the app : “No device found”. Did you test with any tablet or phone only ??? 3) With Samsung tab 4, mirroir woks perfectly, sound and video. So please work hard on bug #6, very irritating!!! are you sure you install the correct app, you should install this one, official made by google. about the following:Try to upload and download a video (mp4) from disk.yandex.com and maybe you see how slow it is + it’s impossible to watch that movie from any web browser (sluggish). i will check download and upload a video from disk.yandex.com, and download the same video from opera to compare the difference? and you said it is impossible to watch movie from any web browser? do you mean the stock browser and opera or firefox chrome are all not good to watch movies? do you test http://www.youtube.com? do you know the flash don’t work in android 4.2 or above,right? this should be a reason? also i just test the google tv remote with nexus 7 2012 wifi tablet. and make sure your tablet and draco aw80 in the same network same band( don’t make one in 2.4Ghz, the other in 5.8ghz), and then launcher the app, click “connect to tv” and it will search and find the device called “draco aw80” hit the connect button. No, it’s NOT the same app!!!. “YOUR APP IS NOT AVAILABLE TO YOUR COUNTRY” is the message I got from Google play!!!!!! !NO INSTALL BUTTON!!! For bug #5, DLNA, I said maybe FLIpps app has bugs, I might be wrong!! Because that app works perfectly with ug007b!!! So, I don’t know the cause of sluggishness!!! This bug might be related to bug#6!!!! For bug#6, slow download, the bug is in OS. I downloaded the same video with ug007b, and it’s really fast. So, it’s not website, not internet speed!!! To watch any movie from disk.yandex.com, it’s impossible (extremely sluggish), as if there was NO BUFFERRING, i had to wait 10 seconds to watch 3 seconds of video. I tried download again from disk.yandex.com and the speed was from 300 to 600 KBytes/s,not steady but acceptable. Maybe last time, Yandex limited download speed limit for some reason unknown to me!!!! Great Review… I was wondering, which one of the Android TV Box is the best so far? I own the Eweat EW802 but I haven’t seen a review of it. 1. It depends what you want to do. For video playback, I think Amlogic S802 is much better, but some people RK3288 / A80 are just fine, as they may have videos supported by the processor. Also some people are very sensitive to skipped frames, and some other less so. RK3288 is probably the best platform for 3D gaming (among the Allwinner/Rockchip/Amlogic SoCs). 2. A device performance changes over time. Hardware shortcomings can’t be fixed (e.g. no power off circuitry, slow flash…), but software can. So an average device without firmware updates will stay an average device, but a less than average device may become an excellent device after several months, and firmware upgrades. That’s why support is also important. Probox2 EX, MINIX NEO X6, Tronsmart Orion R28, and HPH NT-V6 (I’ve heard they fixed the Ethernet issue). The last two however need some improvements with regards to video playback. Thanks!… I think I’ll stay with the EW802 for a while… I’m not gamer and I can watch all my movies from my HDD and the Netflix content without complains… I’m not picky but maybe because it is the first Android TV box that I have owned. Hi, I have been following (from afar mind you) the evolution of the Android TV Boxes, but have yet to buy one. Since you’ve made some reviews about some of the most popular ones, I’d like to ask you a question I haven’t been able to answer myself. What do you think would be the best solution to gain smart TV capabilities, excellent XBMC streaming and playback, with 4k being a plus, and also some decent word processing, spreadsheet viewing and editing and web browsing; keeping the TDP to a minimum? Since these boxes run KitKat I assume one would be able to install an Office pack, such as Open Office, or the like, right? I’m currently debating whether buying an androit TV box, or aseembling an AMD AM1 HTPC, which would be around 100 dollars more than the most expensive TV box. I keep going back and forth between thew two ideas, but my limited knowledge prevents me from being able to make an objective desicion, since I don’t know how the TV Boxes’ hardware would compare to AMD’s AM1 platform. What I like the most about the TV Boxes, is the form factor, small footprint, and looks… Thank you very much in advance.